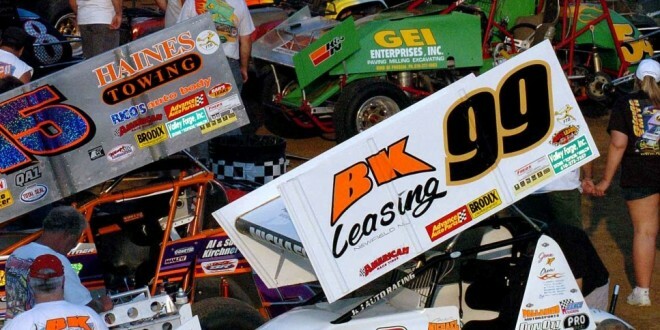 An organized group of car owners and drivers hope to bring back to life the former United Racing ‘Club’ to present a series of 360 Sprint Car events in 2015. The upstart group is planning an open meeting at the Holiday Inn in Bridgeport, N.J., in the next several weeks. By a 22 to 1 vote at a membership meeting ten years ago, control of the United Racing ‘Club’, which was organized in 1948, was given to Bob and Donna Miller along with partners John and Cher Zimmerman. The four had been playing an active role in operating the club and it was felt in the best interest of moving forward that they be allowed to run URC without membership involvement. URC became the United Racing ‘Company’ operating under their control in 2005. The current Rislone URC Sprint Car series schedule is the 67th season under a ‘URC’ banner. “I don’t feel this being adversarial right now,” said Miller to AARN on Monday about the group holding a meeting. After the switch from club to company, the old club name was kept alive, just in case, by three-time URC car owner champion Bill Gallagher. Gallagher told AARN he had found that the United Racing ‘Club’ name was allowed to lapse, so three years ago he made arrangments to protect it. He filed for, and was granted, a Pennsylvania corporation under the name United Racing ‘Club’ using his King of Prussia, Pa., business address. It’s with this name that the new organization might move forward..
Six-time URC championship car owner Pat Palladino has joined Gallagher in the goal of jump starting URC. Palladino, once a well-known figure within URC, has stopped racing and sold off his equipment. While he doesn’t plan to return as a car owner, Palladino will play a large part with the club if it is resurrected. Gallagaher’s current driver, eight-time URC champion Curt Michael, is also helping promote the meeting. “At this point we’re just having an informal meeting to see who is interested,” said Michael on Sunday to AARN. Mike Heffner, a current 410 Sprint Car owner for Greg Hodnett, is also a driving force behind the organization. Heffner, whose No. 27 runs in special 360 Sprint Car races, also promoted a big event this season for the division at Bridgeport Speedway. “Something needs to be done to keep the history of URC alive,” said Heffner who said he didn’t expect to field a 360 Sprint Car on a regular basis next year, but certainly would run special events. Palladino told AARN by phone that all racers are invited to attend the open meeting with ideas and suggestions. He said an election of a Board of Directors would be held at another date if there is interest to continue. He insured this would be a club for the racers, not a group controlled by one or two. According to Palladino, members of his group have talked to several race track promoters as well as current and past 360 Sprint Car teams that are interested in seeing URC return to its former status. Tim Hogue, representing his father who raced and owned cars for many years, was the only person to vote against the change in 2005. Hogue did not race himself this year, but as a car owner is fielding a car and is planning on attending the meeting. Charlie Paige’s Selinsgrove Speedway has become a big player in 360 Sprint Car racing. Selinsgrove allowed 360s to run weekly this year with their 358s for the first time in history making them the only area track to schedule the division on a weekly basis. Selinsgrove also booked six URC events this season as well as events on the rival ESS and Patriot Sprint Tours. Paige told AARN on Saturday night that he’s happy with his season and feels by allowing the 360s to run weekly has silenced tech complaints of the past, especially about the heads used on the Sprint Cars. Look for Selinsgrove’s schedule to be much of the same next year with all three clubs getting dates. That helps grow the track’s car count while introducing outside drivers to the fast 1/2-mile. For many years Paige has enjoyed working with the Millers and Zimmermans with URC. He seemed unaware of a possible return of the URC club, but said if Miller/Zimmerman had a series next year he was likely to stick with them. URC is playing a big part in next weekend’s 360 Nationals being held at Selinsgrove. They then have two races in the Carolinas and a point finale at Grandview Speedway on Saturday, October 18. The 2014 URC season started with a 28 event schedule, including four races in the Carolinas with the USCS series. Because of weather issues and cancellations, just 14 events have been held and only five drivers have attended each event. URC held just one race in the month of July. The biggest issue URC faces, and both sides agree, is a lack of race dates. Miller agrees with Gallagher that the URC purse is a problem in booking dates at many tracks including two in New Jersey (Bridgeport and New Egypt) where they have had no shows at in recent years. “Our purse has just gotten too high to be a second division on a regular Saturday night show,” said Miller. Miller said he’s got about 12 confirmed dates for 2015 for his current winged 360 Sprint Car series. He’s had discussion, however, with several short-tracks about running a wingless series as well. Miller said in the view of safety he’d like to stay away from wingless racing at least in the first year on the bigger half-mile tracks. He said, however there is interest in booking wingless shows at Grandview, Big Diamond and New Egypt. He felt Bridgeport’s 1/4-mile would be perfect if it was just a little bigger. Miller said he’s reached out to Jason McCord from USAC about forming an eastern series with them, but it’s only in the discussion stage. “Maybe there is something that Curt and the other racers can think of that we missed,” Miller bottomlined. Miller is facing another major issue with URC. Rislone, a sponsor for 18 years has informed them they will not be returning next year. Miller said in recent years URC has also lost Choice Hotels and FTD Florist as sponsors. Miller said he’s had more conversations in recent weeks with Michael than in many years. He’s hoping he and his group realize the work involved in talking to promoters to book dates and the time and detail needed to run a racing organization. “What I’m hoping is they have the meeting and we continue to speak and come to the same place where we can put all of our energy together and move forward,” said Miller. Miller said he was not speaking on behalf of his partners (the Zimmermans). “I can’t speak for them, but I think we’re pretty much in line with our thinking. They are more bothered about the discussions going on than I am, but I think we need them. I’m out of corners of where we can go. With a lower point fund because of less sponsorship we need to come up with another idea. We’ve backed ourself in a corner with the higher purse and the higher point fund,’ said Miller.